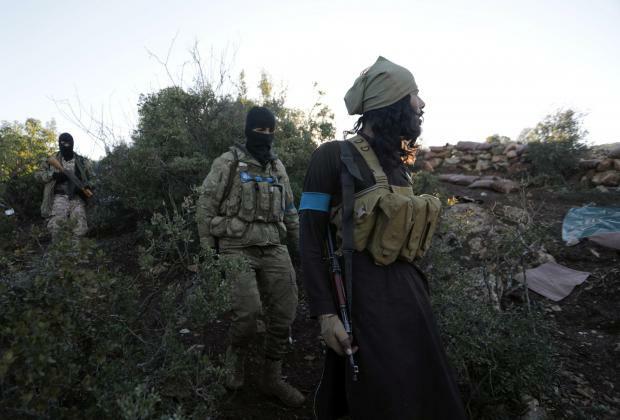 Turkish-backed Free Syrian Army fighters are seen near the city of Afrin, Syria. Syrian state television showed a convoy of pro-government fighters entering the Kurdish-held Afrin region on Tuesday to help fend off a Turkish assault. The fighters wearing camouflage fatigues waved weapons and Syrian flags from their vehicles as they crossed through a checkpoint that bore the insignia of a Kurdish security force. "One Syria, one Syria!" some of them chanted. "We have come to tell our people in Afrin that we are one," said a fighter interviewed on state television, referring to the government stance that Syria must remain one country and internal partitions caused by the war must be eradicated. State news agency SANA accused Turkish forces of shelling territory near the crossing where the "popular forces" entered Afrin. Earlier on Tuesday, Turkish President Tayyip Erdogan said Russia had stepped in to block a deployment of pro-government forces in Afrin, where Ankara is seeking to destroy the Kurdish YPG militia. On Sunday, a Kurdish political official said Damascus had agreed to send Syrian troops into Afrin to help fend off the month-old offensive by Turkey and allied Syrian insurgents. The Syrian government and the YPG have mostly avoided direct conflict during the war, but they espouse very different visions for Syria's future. Each controls more ground than any other side in the conflict.